The soil nail stabilisation technique has been introduced into the construction works of the Phase V Power Development Programme at Pockwood Pond. Phase V of the programme is to increase the capacity to meet the growing demand of electricity and reduce power outages in the Territory. 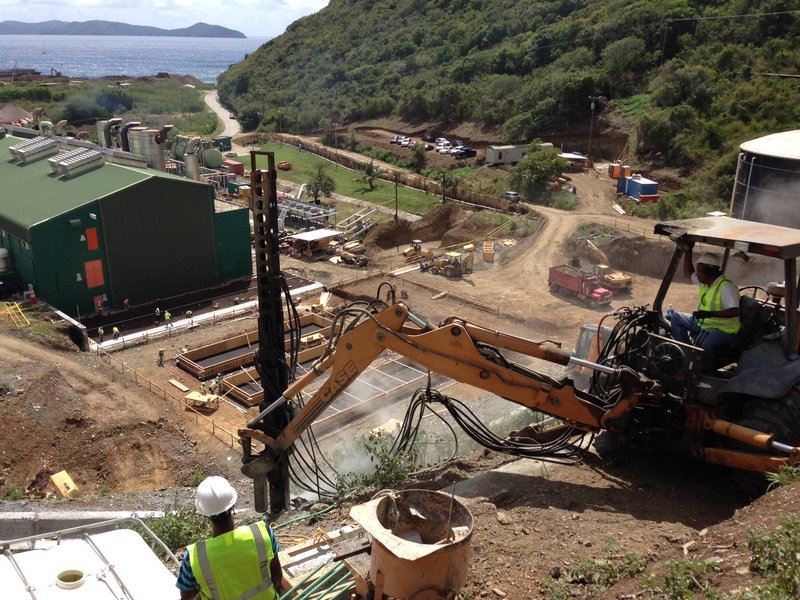 The British Virgin Islands Electricity Corporation (BVIEC) stated that the soil nail stabilisation technique is new to the Territory and is faster to construct compared to other similar methods of stabilisation like retaining walls. The technique also brings soil stability in areas where landslides are highly probable. The process of soil nailing involves drilling holes into the soil for the steel bar (nail) to be inserted. The nails are then grouted into the soil which allows the soil mass to be ‘tied together’, creating a structure similar to a gravity wall. After the nail is placed, a spray on concrete (shot-Crete) layer is usually placed as a facing material along with mesh reinforcement, to protect the exposed nail. The Corporation said that there are several benefits associated with soil nail stabilisation and that it is usually preferred over a retaining wall as it can be used to repair other existing wall systems. The technique also eliminates the time and expense of placing steel piles, and that less concrete and steel reinforcement are required during construction which can help to reduce the overall cost. Soil nailing was first used in 1972 in Versailles and is now a well-established technique around the world. A similar application to soil nailing is rock anchors which are also being installed at Pockwood Pond in a similar way to the soil nails except these are located in the rocks. Phase V of the Power Development Programme also involves the purchase and installation of two diesel-fired generators, adding production capacity of over 16 megawatts of electrical power, plus two 34.5 KV cables, which will follow a separate route to that of the existing Pockwood Pond to Road Town line. Additionally it will further provide reserve capacity to take care of planned and unplanned maintenance on the generating units, thereby reducing the need for load shedding.